Because of the power vested in the EU Commission in Brussels, Belgium, with command over a space encompassing 27 nations with more than 500 million citizens and the largest nominal world gross domestic product (GDP) of 18 trillion US dollars, it’s perhaps no surprise in this era of moral promiscuity that powerful private lobby groups such as the tobacco industry, the drug lobby, the agribusiness lobby and countless others spend enormous sums of money and other favors—legal and sometimes illegal—to influence policy decisions of the EU Commission. This revolving door of corrupt ties between powerful private industry lobby groups and the EU Commission was in full view recently with the ruling of the European Food Safety Administration (EFSA) trying to discredit serious scientific tests about the deadly effects of a variety of Monsanto GMO corn. In September 2012, Food and Chemical Toxicology, a serious international scientific journal, released a study by a team of scientists at France’s Caen University led by Professor Gilles-Eric Seralini. Before publication the Seralini study had been reviewed over a four-month period by a qualified group of scientific peers for its methodology and was deemed publishable. It was no amateur undertaking. The scientists at Caen made carefully-documented results of tests on a group of 200 rats over a two-year life span, basically with one group of non-GMO fed rats, a so-called control group, and the other a group of GMO-fed rats. Significantly, following a long but finally successful legal battle to force Monsanto to release the details of its own study of the safety of its own NK603 maize (corn), Seralini and colleagues reproduced a 2004 Monsanto study published in the same journal and used by the European Food Safety Authority (EFSA) for its 2009 positive evaluation of NK603. Seralini’s group based their experiment on the same protocol as the Monsanto study but, critically, were testing more parameters more frequently. And the rats were studied for much longer—their full two year average life-time instead of just 90 days in the Monsanto study. The long time span proved critical. The first tumors only appeared 4 to7 months into the study. In industry’s earlier 90-day study on the same GMO maize Monsanto NK603, signs of toxicity were seen but were dismissed as “not biologically meaningful” by industry and EFSA alike. It seems they were indeed very biologically meaningful. Such alarming results had not yet become evident in the first 90 days, the length of most all Monsanto and agrichemical industry tests to date, a clear demonstration of how important it was to conduct longer-term tests and apparently why the industry avoided the longer tests. Roundup herbicide, by terms of the license contract with Monsanto, must be used on Monsanto GMO seeds. 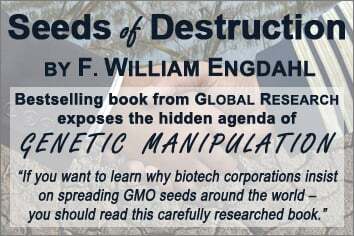 The seeds are in fact genetically “modified” only to resist the weed-killing effect of Monsanto’s own Roundup, the world’s largest-selling weed-killer. Suspiciously enough, Monsanto had repeatedly refused scientific requests to publish the exact chemicals used in its Roundup aside from one—glyphosate. They argued that it was a “trade secret.” Independent analyses by scientists indicated, however, that the combination of glyphosate with Monsanto’s “mystery” added chemicals created a highly toxic cocktail that was shown to toxically affect human embryo cells in doses far lower than used in agriculture. Mammary tumors that developed in rats fed GMO corn and/or low levels of Roundup. From the paper “Long term toxicity of a Roundup herbicide and a Roundup-tolerant genetically modiﬁed maize,” published in Food and Chemical Toxicology. What was more than alarming in the context of Seralini’s first long-term independent study of the effects of a GMO diet on rats was that it took place some twenty years after US President George H.W. Bush gave the commercial release of GMO seeds the green light and mandated no government safety tests before release. Bush did so following a closed-door meeting with top officials of Monsanto Corporation, the world’s largest GMO concern. Suddenly, with worldwide attention to the new Seralini results, clearly the EU Commission and its EFSA was under fire as never in their history and how they reacted was worthy of a bad copy of an Agatha Christie murder novel. Only it was no novel but a real-life conspiracy that evidently involved some form of collusion between Monsanto and the GMO agrichemical cartel, EU commissioners, the GMO panel members of EFSA, complacent major media and several member governments of the EU, including Spain and Holland. Now, in September 2012, three years after the commercial introduction of Monsanto GMO maize in the EU, Seralini showed, complete with ghastly photos, that Monsanto’s GMO maize demonstrably caused severe rates of cancerous tumors and early death in rats. Because of US Government arm-twisting and of the obviously powerful lobby power of the Monsanto-led GMO agrichemical lobby in the US and EU, as of the time of the Seralini study, no regulatory authority in the world had requested mandatory chronic animal feeding studies to be performed for edible GMOs and formulated pesticides. The only studies available were a tiny handful of 90 day rat feeding trials carried out by the biotech industry and no studies longer than that, apparently on the principle that conflict of interest in an area as important as the safety of food should not be taken as a serious matter. Revealingly, the EU stated publicly their seemingly reassuring policy: “GMO critics claim that feeding studies with authorized GMOs have revealed negative health effects. Such claims have not been based on peer-reviewed, scientifically accepted evaluations. If reliable, scientific studies were to indicate any type of health risk, the respective GMO would not receive authorization.”  That was the EU official line until the 2012 Seralini bomb exploded in their faces. The September 2012 Seralini study was peer-reviewed, and it was published in a highly respected international scientific journal after such review. What was the response of the EU Commission and the EFSA? Nothing short of fraudulent deception and coverup of their corruption by the Monsanto GMO lobby. On November 28, 2012, only a few weeks after the study was published, EFSA in Brussels issued a press release with the following conclusion: “Serious defects in the design and methodology of a paper by Séralini et al. mean it does not meet acceptable scientific standards and there is no need to re-examine previous safety evaluations of genetically modified maize NK603.” Per Bergman, who led EFSA’s work, said: “EFSA’s analysis has shown that deficiencies in the Séralini et al. paper mean it is of insufficient scientific quality for risk assessment. We believe the completion of this evaluation process has brought clarity to the issue.”  Nothing could have been farther from the truth. At the very minimum, the precautionary principle in instances involving even the potential for grave damage to the human population would mandate that the EU Commission and its EFSA should order immediate further serious, independent long-term studies to prove or disprove the results of the Seralini tests. That refusal to re-examine its earlier decision to approve Monsanto GMO maize, no matter what flaws might or might not have been in the Seralini study, suggested the EFSA might be trying to cover for the GMO agrichemical lobby at the very least. More damaging for the shoddy EFSA coverup on behalf of Monsanto was the fact that over half of the scientists involved in the GMO panel which positively reviewed the Monsanto’s study for GMO maize in 2009, leading to its EU-wide authorization, had conflicts of interests with the biotech industry. A report by Corporate Europe Observatory (CEO) found that more than half of the GMO panel experts who signed the approval had conflicts of interest. The conflicts ranged from receiving research funding from the biotech industry, being a member or collaborator in a pro-biotech industry association, to writing or reviewing industry-sponsored publications. Some conflicts revealed a conflict of scientific interests, with some panel members involved in working on the creation of transgenic plants – including potatoes – with antibiotic-resistant marker genes – including nptII. Secondly, although none of EFSA’s GMO panel members were medical experts in the use of antibiotics in human medicine, they decided that neomycin and kanamycin were antibiotics with “no or only minor therapeutic relevance”. The World Health Organisation (WHO) classified these antibiotics as “critically important” in 2005. Dutch scientist Harry Kuiper, chair of the EFSA GMO panel who had close links to the biotech industry, played a key role in the framing of this disputed key scientific advice. The brazen conflicts of interest between Monsanto and the agribusiness lobby and the EFSA went further. In May 2012 Professor Diána Bánáti was forced to resign as Chairman of the EFSA Management Board when it was learned she planned to take up a professional position at the Monsanto-backed International Life Sciences Institute (ILSI) in Washington. The same Diána Bánáti had been forced to resign, not as EFSA chairman but as a simultaneous Board Member of ILSI in 2010. Public interest groups made calls for her to resign from EFSA but to no avail. At ILSI she will be able to use expertise and contacts gained from working for the EFSA to help GMO companies like Monsanto and other food industry companies influence policy across the world. The EFSA is not the only source of blatant and reckless pro-GMO sentiment in Brussels. Some weeks before release of the embarrassing Seralini study, Anne Glover, chief scientific adviser of the EU Commission, said in an interview on 24 July, 2012, “There is no substantiated case of any adverse impact on human health, animal health or environmental health, so that’s pretty robust evidence, and I would be confident in saying that there is no more risk in eating GMO food than eating conventionally farmed food.” She added that the precautionary principle also no longer applies, which means the EU should not err on the side of caution on the approval of GMOs. Were there any pretense of scientific responsibility in the clearly corrupt EFSA panel, or Professor Glover’s office, they would have immediately called for multiple, independent similar long-term rat studies to confirm or disprove the Seralini results. They and the Monsanto GMO lobby influencing them clearly had no desire to do anything but try to slander the Seralini group with vague accusations and hope the obedient international media would take the headline and close the embarrassing story. It was typical of the entire history of the spread of patented GMO seeds and paired toxic herbicides like Roundup. Seralini et al., Op. Cit. Gilles-Eric Seralini et al, Genetically modified crops safety assessments: present limits and possible improvements, Environmental Sciences Europe 2011, 23:10, accessed in http://www.enveurope.com/content/23/1/10. Aris, A., Leblanc, S., Maternal and fetal exposure to pesticides associated to genetically modified foods in Eastern Townships of Quebec, Canada, Reproductive Toxicology, 2011 May;31(4):528-33. Epub 2011 Feb 18. European Food Safety Authority (EFSA), Scientific Opinion of the Panel on Genetically Modified Organisms on applications (EFSA-GMO-NL-2005-22 and EFSA-GMO-RX-NK603) for the placing on the market of the genetically modified glyphosate tolerant maize NK603 for cultivation, food and feed uses and import and processing, and for renewal of the authorisation of maize NK603 as existing product, The EFSA Journal (2009) 1137, 1-50. EFSA, Séralini et al. study conclusions not supported by data, says EU risk assessment community, EFSA Press Release, 28 November 2012, accessed in http://www.efsa.europa.eu/en/press/news/121128.htm.